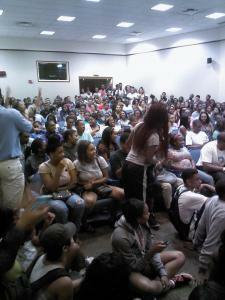 A capacity group gathers to watch the Obama-Romney debate in the student center at Hampton University in Virginia. Students nationwide are following the series of debates on TV and Twitter. Vice President Biden and U.S. Rep. Paul Ryan, R-Wis., came prepared for battle. And it definitely showed. The two wasted no time getting to the issues in their uncharacteristically combative 90-minute televised debate Thursday. Biden and Ryan verbally sparred on everything from the state of the economy to military spending. The two consistently interrupted each other and Biden, seemingly making up for President Obama’s lackluster first-debate performance last week, rebutted with tenacity, smiled incredulously and even chuckled at some of Ryan’s responses. According to a CNN poll, the debate winner was Ryan 48 percent, Biden 44 percent with the margin between the two candidates within the polls’ five-point sampling error. The results didn’t accurately express the thoughts of a few students at Hampton University in Virginia. Turnout was light compared to the over-capacity crowd who watched last week’s presidential debate in the 200-person theater at the student center. Naja McGowan is a student in the Scripps Howard School of Journalism and Communications at Hampton University.